Milly Bobby Brown was recently confirmed through mysterious "nameless sources" to be returning as Eleven on Netflix's summer hit "Stranger Things." Now the curtain has risen on the majority of the young actors appearing in the second season. The show's Twitter account has debuted the first photo from Season Two, taken during a table read. You may need to flip your screen to see everyone, though, as the crew appears to have spent too much time in the Upside Down. 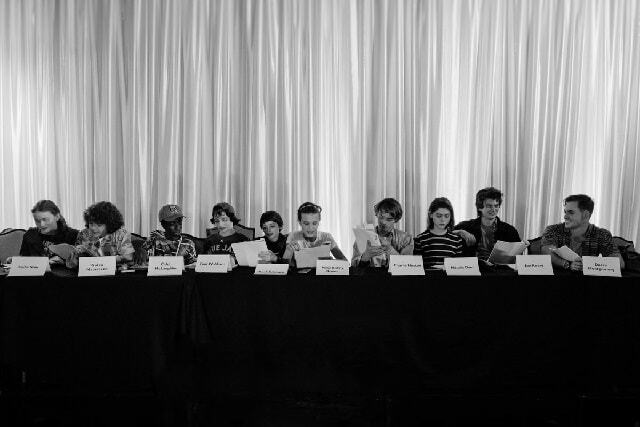 Several cast members from Season One are back, including the remainder of Eleven's fearsome foursome, Mike, Dustin and Lucas (Finn Wolfhard, Gaten Matarazzo, Caleb McLaughlin). Fans of STANCY will be happy to know that Joe Keery and Natalia Dyer will return as Steve and Nancy. The Byers boys, Charlie Heaton (Johnathan) and Noah Schapp (Will), are also there, along with the two new kids on the strangest block, Sadie Sink (Max) and Dacre Montgomery (Billy). No adults are featured in the photo, but Netflix has all but confirmed that Winona Ryder (Joyce Byers) and David Harbour (Chief of Police Jim Hopper) will return. Not a tremendous amount is known about what awaits the fine folks of the fictional town of Hawkins, Indiana, but fans are already piecing together clues as to what happens next. One thing that has been confirmed is that Barb (Shannon Purser), is not coming back ... at least not alive. Netflix recently released a video of an in-universe newscast that as the question of the common fan: What happened to Barb? The second season of “Stranger Things” is slated for release in 2017 on Netflix.